Record storage & management has become an important part of any organization. From time to time, a company begins all of its transactions from keeping its records on various things. These records are needed for referral purposes, modifying a particular record and most of the time – non-required records are disposed of. These record storage process in an organization needs to be managed professionally and not all are aware of Records Storage Management Services like Panoramic Record Storage & Management. Not many of us realize despite the huge amount of records that anyone maintains, takes up a lot of company resources in terms of infrastructure and finances. Records storage is an intrinsic part of any organization and there are times when most records outlive its existence. Paper records, especially, when kept for undue longer time is prone to insects and rodents that not only reduces the life of your paper records but also damages them. Inappropriate care of the papers like uncontrolled temperature, too low or high humidity, dusts, dirt all adds to the proliferation of insects that feed on the cellulose contained in paper. Unintended introduction of food in the papers or in the area where papers are stored results in rodent infestations. Haphazard document storage or incorrect storage also results in loss or damage to the records or both. Proper care and maintenance of the records is important. Any record might be precious for a company and it takes more than simply stacking the records on top of one another hoping it will last forever. 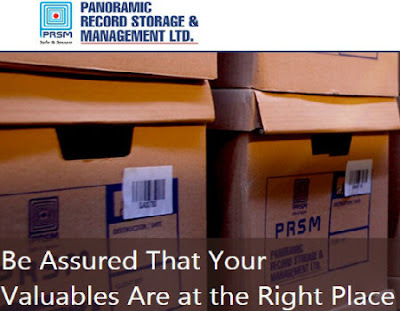 At Panoramic RSM, utmost care is taken for offsite file storage to make sure maximum longevity of your paper records. We ship your records from your doorstep and store it in boxes in our dedicated storage facility. This facility is monitored 24/7 to make sure maximum security of your records. Temperature is regularly maintained reducing your paper record’s ageing process. When you physically access the records, the contents will show the same legibility when you first trusted us with its keeping. We also make sure that your records remain untouched with pestilence as long as we are responsible for its upkeep. By keeping the unwanted insects at bay, we will make sure all the contents in your files remain unchanged. From time to time, your paper records are treated with insecticides to discourage any proliferation of paper infesting insects that will bring any harm to your records. Our expertise in Box File Management where all the files are placed in boxes - the files are bar-coded for easy reference. Our easy to use web applications will let you to ask any record’s retrieval at your requested time. Unique to Panoramic RSM, our in-house IT will be able to customize software solutions to your need – offering your convenience that no other RSM can give. We offer many RSM solutions as well. Do you need digitization of records? Let us know and we’ll be happy to help. You can then access your records online and at your convenience. By switching to paperless, we’re in fact helping the environment by using less paper. Less paper would mean less cutting down of trees. Records do not need to be maintained forever. Dependency on old records that are not used must be discarded and or it can also be digitized for later access. For those records that do not need any mandatory submissions towards income taxes or sales tax, such records can be conveniently digitized and the Panoramic RSM can handle the safe and secure discarding of your old records as you want it and when you want it with our document storage solutions and destruction of your old records. Each point of article is beneficial for me. There are numerous list of storage companies in bangalore which give reliable service at nominal cost.